This is a bread shop with a difference. It isn’t exactly a restaurant but you can eat so we decided to review anyway. 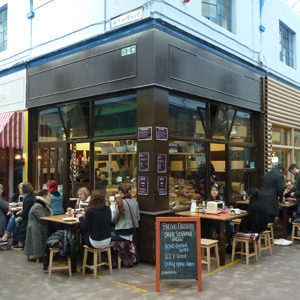 It is a small offshoot of a place in Clapham so they do have some experience which was lacking in many of the restaurants in Brixton Village. The inside of Breads Etcetera allows about two people room to breathe and a third means you have to shuffle around to see the breads on sale. It is essentially a bakery with a couple of ovens. But you can sit down – outside the shop on a few tables. As you can imagine that means it is a bit chilly in the aisles of the Village so they thoughtfully provide a blanket which is definitely needed in all months except a sunny day in July. So is your coat. Food is, of course, bread based but you can get eggs (soft or hard boiled) and side orders of ham or cheese. The staff are really very helpful and cheerful which you need first thing in the morning. Coffee is very good and comes with a design on top to make you smile. But the main deal is the DIY breakfast with toasters on the table and butter and spreads provided. You can go for English breakfast with sausages etc. and at the moment this is only on Sundays but that can change. The charm is in the toast, always hot and ready to take the melting butter, and the coffee. So what about the bread. It’s sourdough – wheat or rye . This is a good product but…… we usually save discussions of cost to the end of the review but I have moved it forward as this is its drawback. It is expensive. We would eat breakfast here as but we wouldn’t go back for the bread and I really like sourdough. Breakfast is about £5 to £6 per person if you have side orders.